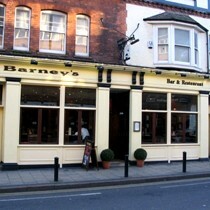 Barneys in St Albans is a popular Irish bar near the top of London Road. It is often very busy at weekends when it can be difficult to get to the bar and get served. No real ale and generally a poor selection of beer. Drinks are relatively expensive compared to some other local pubs. Background noise, both conversations and music, is very loud so don't expect a quiet chat. You may have to shout your orders to the bar person when it's busy at weekends. Drinkers are generally a good mix of male and female, mostly in their twenties and thirties. Very few seats are available and these are only a couple of bar stools by the window. Strangly there are framed high class shopping bags hanging on the walls. Apparently free Wi-Fi is offered at Barneys but it is not always working. Notice up saying opening soon as a bar / restaurant (possibly Indian).